Goodreads says, "Sometimes there's no turning back. Amber's life is spinning out of control. All she wants is to turn up the volume on her iPod until all of the demands of her family and friends fade away. So she sneaks off to the beach to spend a day by herself. Then Amber meets Cade. Their attraction is instant, and Amber can tell that he's also looking for an escape. Together they decide to share a perfect day: no pasts, no fears, no regrets. The more time that Amber spends with Cade, the more she's drawn to him. And the more she's troubled by his darkness. Because Cade's not just living in the now--he's living each moment like it's his last." Amber sneaks off to spend the day by herself at the beach. She wants to leave her worries and responsibilities behind for just one perfect day. She meets Cade, who she instantly feels connected to and they spend a beautiful day together. As the story progresses, Amber realizes that she and Cade have a lot in common. He has his own secrets as well and deals with some serious issues. 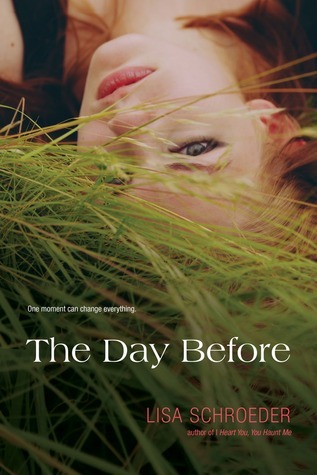 Lisa Schroeder's The Day Before is a novel told in verse that is a powerful story about life's inevitable ups and downs. This is the first book I've read by Schroeder and there is no doubt that she is a talented writer. I feel that it is harder to write in verse and truly capture a character's story, but Schroeder does it beautifully. In fact, many of the moments in the novel are enhanced because they are written in verse. It feels more powerful. On the other hand, at times I wanted more. I wanted more background on Amber and I wanted to go deeper into the story. I wanted more closure. I felt like the verse format held me back at times, but at other times, it enhanced the story. As you can see, I had a mixed experience with the format of The Day Before. It was definitely a love/hate relationship. Schroeder captures that one special day at the beach where you can just forget about it all and it's even better when it's shared with someone else. I loved the picture that she painted and the quiet moments that Amber and Cade shared. It was lovely and since this book deals with serious life issues, Schroeder has readers reflect upon what is truly important in life. One thing that irked me was the insta-love in this book. Sometimes the whole love at first sight/infatuation works in a novel, but here it felt rushed. Maybe because it's written in verse, but I just felt like all of a sudden Amber was "in love." I just wasn't buying it and perhaps that's because I'm not a teenager. If you are looking for a summer read that has a lot of substance, then The Day Before is one you should pick up. It make for an excellent beach read as it's easy to get through in one sitting. Although it didn't "wow" me, I thought the message was meaningful and parts of the novel were extremely eloquent. Needless to say, I am impressed with Schroeder's command of language and I plan on checking out some of her other novels written in verse in the future. I just finished Tighter and had a similar reaction - I liked it but I wanted more. I couldn't tell you exactly more of what, but just more:) This does seem like a good read for summer though! I really loved The Day Before but maybe because I related to it on a more personal level. I haven't read a lot of verse novels and I have to say that I'm not loving them. This does sounds very good and a great summer read. I'm thinking about getting a copy. ;) Great review. I'll watch out for insta love! I loved another one of Lisa's books, so I'm excited to read this one! I've never read a novel written in verse, but I have this one downloaded from Galley Grab as I love the sound of it. I've heard it described as a YA Before Sunrise - that's one of my favourite movies, so I'm looking forwardd to seeing how this will compare. I have read a few mixed reviews of this one, though!